“Brain disorders are my thing,” says John Medina, who lives in a state of fastination with the brain's inner workings. Those questions led to Medina’s new book. Brain Rules: 12 Principles for Surviving and Thriving at Work, Home, and School (Pear Press, 2008) sparks with the author’s explosive humor and jaw-dropping anecdotes, teaching people how to boost their brain power in every area of life. Each chapter presents a “brain rule” — something scientists consider a certainty about how the brain works — and then spells out how that rule might transform lives for the better. Medina’s perspective, as well as his personality, have stirred up excitement across the country. Since its publication last spring, Brain Rules has consistently been one of the top 10 science books on Amazon.com. It has been featured in The Harvard Business Review, and Medina has made appearances on ABC News and National Public Radio. One of the book’s key observations is the importance of exercise in habilitating proper brain function. Medina practices what he preaches. He’s installed a treadmill in his office at SPU, and answers his email while he walks. SPU receives a five-year $3.7 million grant from the NSF. Sculptures by students brought together a neighborhood. Autumn Quarter 2008 saw the largest, most diverse student body ever come to campus. Grants are allowing student teachers to increase intercultural competency. The Day of Common Learning explored the importance of beauty. The Kilns received status as a historic site after major renovation. Longtime SPU athletic director returns to role in fundraising and development. Two majors emerge out of SPU’s signature commitment to practice radical reconciliation. Nursing students received notice for creating DVD aimed at aiding senior adults. 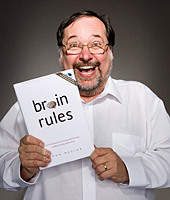 Dr. John Medina’s new book gives readers “brain rules” for home, work, and school.